A surgery for the correction of the middle third of the face with external distrator was performed for the first time at the Gambelas Hospital and also for the first time in Portugal. The patient suffers from a rare disease - Acrodisostosis - where the bones of the hands and feet as well as of the face, do not develop correctly, resulting in important functional and aesthetic incapacity. According to the surgeons responsible, Dr. David Sanz (Maxillofacial Surgeon) and Dr. David Ângelo (Stomatologist), this surgery is technically complex, but the very rigorous 3D planning which was carried out, resulted in a reduced surgical risks and a prediction of the final result . 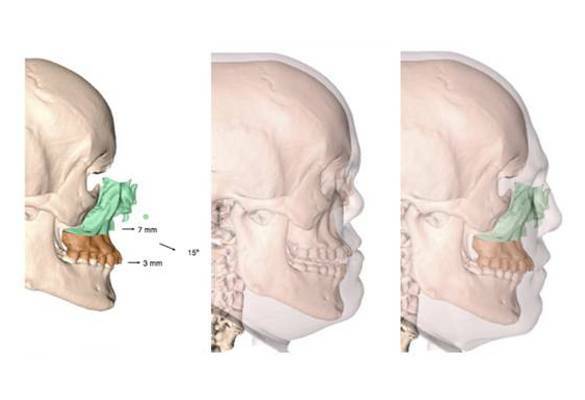 Two osteotomies were performed (cuts in the bone) and a distractor was placed, which will be adjusted daily producing a progressive advancement of the bone and soft tissue at a rate of 1mm per day, thus projecting the entire center of the face. This technique permits bone movement without compromising the attached tissues. The surgery lasted for 7 and a half hours, both the Surgical Team and the family were very pleased with the results.